Murthy's words were taken as scepticism about the lingering relocation, prompting serious concerns not only in the media. In the city council it was rumoured that the concrete shell delivered in 2009 might be demolished altogether. Even the mayor decided to speak out, calling on Valencia CF to come forward with solid proposals. The chaos was completely unnecessary because in the very same interview Murthy confirmed that relocation is not being abandoned. Unnecessary – perhaps. But warranted to some extent. After all, according to mutual understanding between the city and club, the old stadium was to be demolished around 2021. That date is unrealistic already, now being commonly replaced by 2022/23. Even more, details on progress were expected on March 15 but nothing was presented to the public. At present general director Mateu Alemany is expected to make such announcement in April. Most important information would concern the sale of old Mestalla. 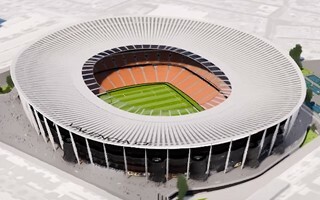 You may remember that in spring of 2018 Valencia teamed up with Deloitte, who are advising on how to secure enough funding to finish Nou Mestalla's construction and sale of the current stadium is a necessity. Back in December there were supposedly 25-26 candidates expressing interest in the old stadium's site. Most of them are understood to not have filed an actual offer, but we should know more about a potential transaction in April. What is known is that it's not a simple sale of land. The funding would have to be put forward 2-3 years before Mestalla gets demolished, which forces potential buyer to wait very long for potential revenue from the transaction. Construction of Nou Mestalla was launched in 2007, just before the economic crash of 2008 and collapse of real estate market in Spain. The club was barely salvaged from folding but construction of the stadium stopped for good in 2009. It's now been a decade-old concrete structure of what was dreamed to be Spain's third largest stadium. In an effort to finish work, two major redesigns took place. In 2013 it was scaled down from 73,000+ seats to 61,500. Then in 2017 further cost-cutting was introduced and the new stadium would begin with 55,000 seats, only to grow once financial capability and demand warrant such changes.